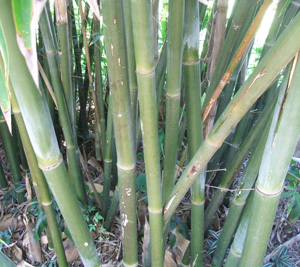 A cultivar of Bambusa textilis, this beautiful, classically Asian looking bamboo prefers full sun. It grows erect, is tight clumping with small leaves, dense graceful foliage and thin walled culms. The new culms have a light covering of waxy powder including a powder ring below the node. This is an outstanding ornamental bamboo native to China's Hainan Island. It will be a wonderful addition to any garden.